This Institute belongs to the Chinese Academy of Science and functions also as a national Science library. The title of the Workshop was "Knowledge Organization and Knowledge Link 2010"
About 100, mostly graduate and postgraduate students from Library Science Schools within Beijing participated in the workshop. Actually the workshop was more a seminar with 6 lectures distributed over the day. Fortunately there was allocated enough time for all the lectures to allow for questions and discussion. There were actually very many questions from the audience after every presentation. The times, in which silence after a presentation of a "leader" iwas normal are gone! Young people are asking questions and also critical ones. 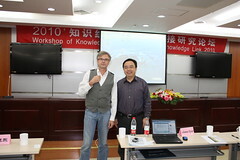 The high quality and the practical relevance of all contributions at the workshop was remarkable. There were 4 contributions from external experts and 2 internal presentations about the work of the Institute. The institutes starts to revatilize and to redefine the role of the legacy vocabularies under its responsability. (esp. the Chinese thesaurus for science and technology). They want to make them good tools for information management in the area of CAS activities. The Institute was very wise to recur to the buy in of external expertise. Especially Dr. Shiyan Ou from Nanjing University is working on a "state of the art" level in the area of vocabularies, vocabulary services and linked data. Agrovoc and FAOs work on AGROVOC was cited as example in two of the Chinese contributions, inspite of coming these researchers from different subject areas.